Q. Although we retain the IP, is the intent to provide an unlimited license to HHS as part of this challenge? A. The use of the license would be limited to the scope of the challenge. Per the Public Notice, by participating in the challenge, each entrant hereby irrevocably grants to ONC a limited, non-exclusive, royalty-free, worldwide license and right to reproduce, publicly perform, publicly display, and use the submission, including the software application, to the extent necessary to administer the challenge, and to publicly perform and publicly display the submission, including, without limitation, for advertising and promotional purposes relating to the challenge. Q. Can you use other publicly available data sets – or only this data set? A. 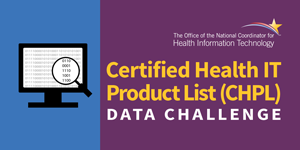 Per the Public Notice for this challenge, use of additional data platforms and sources beyond the CHPL, with emphasis on publicly available data, are encouraged, but not required. Q.Do we have to share the source code for the web app? A. It is not a submission requirement to share the source code for the application. Q.For clarity, do the participants need to create a software application or can they present the solution within a software application? (i.e. use something that may be developed to present a novel solution). A. Participants can present their solution within an existing software application as long as it demonstrates use of the CHPL data. Per the Public Notice, the software application may be integrated into an existing web, mobile, voice, electronic health record, or other platform for supporting interactions of the content provided with other capabilities. Examples include query-based prompts that generate messages, visualization methods that graphically display messages, delivery of information with other platforms with calendar functions, and uses of gaming approaches aimed at enhancing consumer actions, among others. Q. If the solution is a SaaS solution, can we submit a link to a password protected website to meet the requirements for submitting a copy of the software application? A. A file containing a link, and any instructions, for accessing the application can be uploaded through the Submission Form. Q. So the last two questions are related to my question. A SaaS solution is a web app and I’m just wanting to know if I can password protect the site so as not to publish it before the competition is over. A. Yes, a password-protected site is permitted as long as instructions for accessing the application are provided with the submission. Q. If the source code not necessary? How to ensure security? A. Source code is not required for submission. You may provide access to the source code, but the code will not be reviewed as part of the challenge judging process. Web-based submissions are expected to fulfill basic internet security best practices. Encourage to perform quality review and testing for malware prior to submission. Q. Who ultimately owns the IP for the solution? A. Per the Public Notice, each entrant retains title and full ownership in and to their submission. Entrants expressly reserve all intellectual property rights not expressly granted under this notice. Q. Will this presentation be sent out to us to reference? A. A recording of the informational webinar is available for download or streaming through the CHPL Data Challenge site (https://www.cccinnovationcenter.com/challenges/chpl-data-challenge/). Q. If you have a web application how would we deliver it to you? Q. You ask for a copy of the software. Does that mean the software has to be a standalone application, or can it be a web app, hosted by the vendor? A. The software does not need to be a standalone application. Per the Public Notice, the software application may be integrated into an existing web, mobile, voice, electronic health record, or other platform for supporting interactions of the content provided with other capabilities.